For more than 30 years the ERC has been advancing the rights of people with disabilities. Today, more than 50 million people in the United States, approximately one in five, have some type of disability. D isability can be temporary or chronic, acquired at birth or later in life, and, of all the protected classes, it is one of the only protected classes in which anyone at any time may find him or herself a member. The ERC takes a multifaceted approach to protecting and advocating for the civil rights of people with disabilities, with a goal of assuring that people with disabilities have the same choices and opportunities that people without disabilities enjoy every day. While people with disabilities have the same protections under the law as any other protected group seeking housing, employment, shopping opportunities, or government services, there are additional requirements that relate specifically to how buildings are designed. Even though accessibility laws are comprehensive, there are many exemptions and technicalities that make understanding design requirements difficult to providers as well as those trying to take advantage of goods and services. More than 40,000 retail locations, including grocery stores, movie theaters, restaurants, stores, etc. Are now accessible to people with disabilities. People with disabilities deserve accessible housing, but making home accessible requires collaboration and compliance. The ERC has developed a series of resources designed to educate folks about the fair housing rights of people with disabilities, help housing providers comply with fair housing best practices, and empower people with disabilities to advocate for themselves. These include a toolkit about reasonable accommodations and modifications, FAQs targeted at housing providers, a template for third parties to use when verifying a person’s disability, a public service announcement about service animal fraud, and a one-pager explaining service and assistance animals under the FHA and ADA. The Equal Rights Center released a report based on a civil rights testing investigation into housing accessibility for people with disabilities. 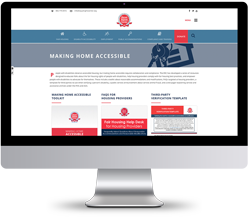 The report revealed numerous barriers to access for people with disabilities searching for housing in the Greater Washington, DC area, both online and in person. In particular, the report’s findings raise major concerns about website inaccessibility. Using civil rights testing, the ERC conducted a total of 50 tests: 25 online tests and 25 in-person tests. Both types of testing employed in this study, online and in-person, revealed significant barriers for housing applicants and residents with disabilities. The Equal Rights Center and Target, the second-largest discount store retailer in the United States, entered into an Accessibility Initiative Agreement to improve accessibility at three Target locations in Washington, DC and New York, NY. 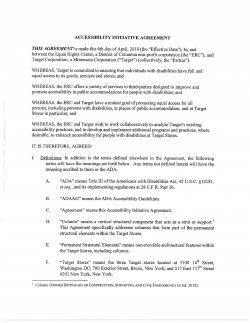 Under the Agreement, the ERC will work collaboratively with Target to analyze their existing accessibility practices, and if necessary, help develop and implement additional programs and practices to enhance accessibility for people with disabilities. In addition to the policy reviews, Target has agreed to maintain the accessibility of checkout lanes and Point of Sale machines, the accessible features of restrooms and fitting rooms as required by the ADA Accessibility Guidelines (ADAAG), and clear paths of travel around structural beams so that wheelchair users can shop without encountering barriers that prevent access through Target shopping aisles. 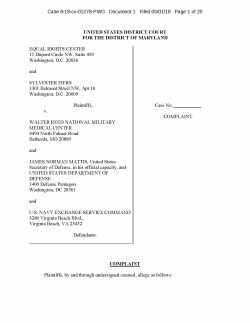 WASHINGTON, DC – May 2, 2018 — The Equal Rights Center, a national non-profit civil rights organization based in Washington, DC, together with Sylvester Fiers, a military dependent with disabilities and a member of the Equal Rights Center, filed a lawsuit against Walter Reed National Military Medical Center and the Navy Exchange (Walter Reed) for failing to meet a basic need of many of the center’s patients – access to restrooms. 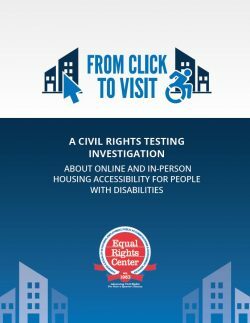 The filing comes after months of unsuccessful negotiations with Walter Reed to commit to actionable and measurable steps to expeditiously address the barriers the Equal Rights Center’s civil rights testing uncovered and Plaintiff Fiers personally experiences each time he visits Walter Reed. 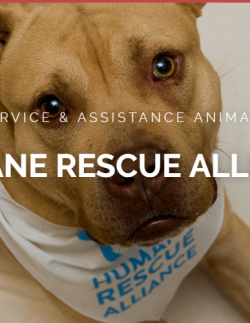 The Equal Rights Center collaborated with the Humane Rescue Alliance in 2017 to provide trainings and resources on the use of service and assistance animals in public accommodations and housing. The Humane Alliance has now published the training materials on their website for any individuals in seeking information about their rights in these spaces. 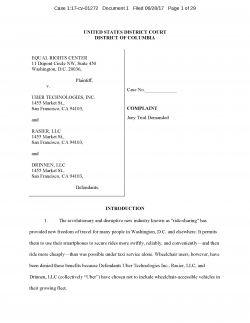 WASHINGTON, DC – June 28, 2017 — The Equal Rights Center, a national non-profit civil rights organization based in Washington, DC, filed a lawsuit against Uber Technologies, Inc., alleging that Uber has designed and operated its transportation service in the District of Columbia in a way that effectively excludes wheelchair users from its basic “UberX” product, and instead, directs them to the limited number of accessible DC taxi cabs through their “TAXI WAV” (wheelchair accessible vehicle) option. The lawsuit also alleges that none of the 30,000 or more vehicles operated by Uber drivers in the District is capable of transporting individuals who use wheelchairs that cannot be folded and stowed in a trunk. As a result, wheelchair users are deprived of the opportunity to ride in Uber-affiliated vehicles, and subjected to substantially longer wait times and higher fares as compared to other Uber customers. 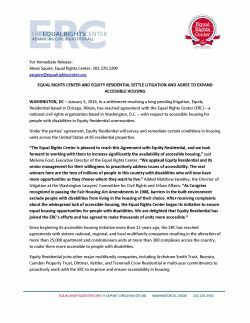 WASHINGTON, DC – January 5, 2016 — In a settlement resolving a long-pending litigation, Equity Residential based in Chicago, Illinois, has reached agreement with the Equal Rights Center, a national civil rights organization based in Washington, DC, with respect to accessible housing for people with disabilities in Equity Residential communities. WASHINGTON, DC – October 22, 2014 — The Equal Rights Center, a national non-profit civil rights organization based in Washington, DC, filed a lawsuit in the U.S. District Court for the Northern District of Illinois against Kohl’s Corporation and Kohl’s Department Stores, Inc. (Kohl’s), a Wisconsin-based department store retail chain. 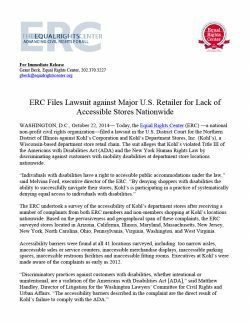 The suit alleges that Kohl’s violated Title III of the Americans with Disabilities Act (ADA) and the New York Human Rights Law by discriminating against customers with mobility disabilities at department store locations nationwide.